BOSTON – With 4 minutes and 5 seconds left in the first period of Game 6 of the Stanley Cup Final, Doug and Darlene Shaw watched their 21-year-old son Andrew collapse to the ice in pain. The Chicago Blackhawks forward was face down. The Boston Bruins faithful at TD Garden on Monday night jeered when the play was stopped, as the home team appeared to have a scoring opportunity. But Shaw had taken a puck to the face, off the stick of Shawn Thornton, and the officials deemed the incident severe enough to warrant a stoppage. “He was either dead, or he comes back. That’s the way it is,” said Doug Shaw. Shaw returned in the second period, with a gash on his right cheek that would bleed intermittently throughout the game, like some kind of Stanley Cup stigmata. At one point the officials appeared to send him back to the Chicago bench to get the wound cleaned. Which is gross, but also very hockey. He would play 10 minutes in Game 6, and didn’t have a point. But at the end, when he hoisted the Cup, his face was symbolic of the physical toll the Blackhawks paid in winning their second title in four years. Here's Shaw with the Cup. The Bellville, Ont. native made his mark on the Chicago Cup run. He scored the game-winning overtime goal in Game 1 of the Stanley Cup Final, as well as the game-winner in a two-goal Game 5 effort that sparked the Blackhawks’ rally from 3-1 down to the Detroit Red Wings in the conference semifinal. In the end, Shaw and his teammates overcame some tough challenges and captured the Chalice. “This is unbelievable,” said Doug Shaw. “There are guys that play 20 years and never get a chance. He’s the luckiest kid in the world,” he said. 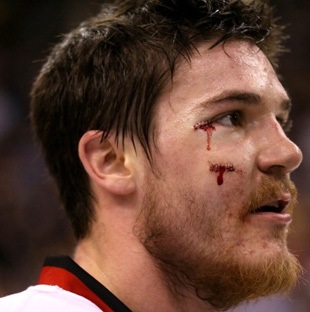 Here’s Andrew Shaw after Game 6, talking about the journey and winning the championship … as his face bled. For the Shaws, it wasn’t just that their son won the Stanley Cup. It’s that he won it as a Chicago Blackhawk, a franchise that they consider a family. In fact, the team flew 180 players’ family members to Game 6 on the chance that they would win the Cup on Monday night. The Shaws are proud of their son, the Blackhawk. And their son is proud to be one. “He loves the Hawks. He loves Chicago,” said Darlene Shaw. • Stanley Cup Final most watched ‘on record’ in U.S.
• Are the Chicago Blackhawks an NHL dynasty?